Jan 9, 2010. Our raptor search began across the street from the curiously birdless Desert-Aire Golf Course with some nice non-raptors, a field full of Mountain Bluebirds including some stunningly beautiful males. We then tooled around looking for whatever was to be found, dodging the flatland speedsters on their way to elsewhere. 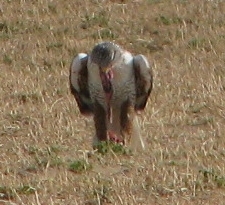 Red-tailed Hawks were numerous and varied, including several extremely dark birds with black bellies and under-fore-wings, and dark red breasts. At the Ave. K wash between 50th & 70th Sts. east, we walked several hundred yards south until we ran across a LeConte’s Thrasher (a lifer for some) who was nice enough to get up and sing for us. We also had a Rock Wren and our first of at least 6 Loggerhead Shrikes, scattered in singletons around the valley. The large grassy field on the SE corner of I & 110th E had the reported many dozens of Mountain Plovers, plus many Killdeer, hoards of Horned Larks, at least a dozen Long-billed Curlews and many Western Meadowlarks. 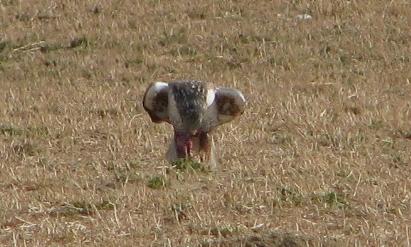 while a Ferruginous Hawk kept the plovers on their toes. The hawk was more interested in rodents however, as we watched him dive and capture one and eat the whole animal in one gulp. We checked a tamarisk grove at H & 110th east that harbored a Long-eared Owl several years back, but the trees hadn’t fully recovered from a fire and lacked enough protective foliage to shelter any birds. After lunchtime at the Saddleback Butte campground, with very pleasant weather (no wind, about 55° but feeling warmer in the sun) and cookies from Carol, we headed to Apollo Park. We found a variety of ducks there, a lot of Canada Geese, and some Dark-eyed Juncos we hadn’t yet seen. A Rough-legged Hawk dashed in front of the cars as we rounded a bend at the SW corner of the Poppy Preserve. We stopped and watched it fly on out of sight around a hill, never to return. It may not sound like we’d done much, but with all the starts and stops, Horned Larks and various blackbirds, we’d managed to while away about six hours, so we headed on to Holiday Lake near Ave. D and 260th west, passing a Northern Harrier on the way. The lake was full of Canada Geese, plus some Mallards and Green-winged Teal. At least two dozen Black-crowned Night Herons emerged from the reeds and roosted in the trees, as it was just beginning to get dark. A Marsh Wren worked the reeds at water’s edge. Chris found a Red-breasted Sapsucker working over a tree; Great-tailed Grackles called as Jean spotted a Great-horned Owl roosting in a tree across the lake, staring at the humans jabbering away. 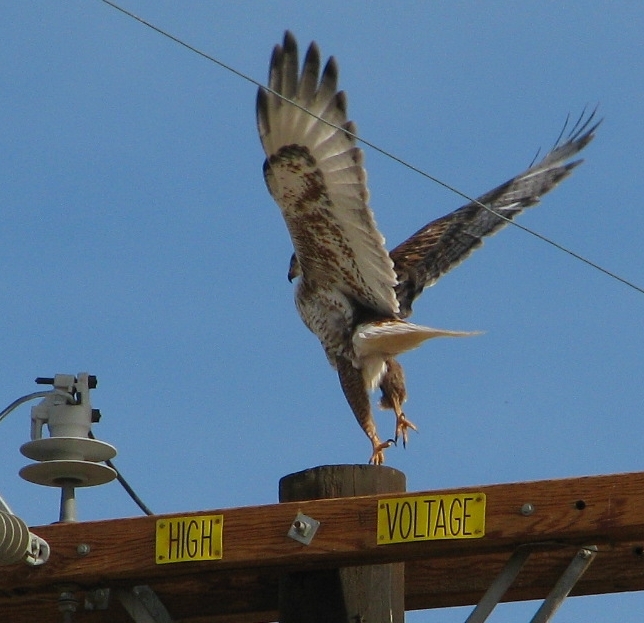 While heading on to Gorman to refuel, we spotted a Prairie Falcon landing in a tree, dark wing-pits and all. All told, we drove about 220 miles, birded for almost 9 hours, spotted 56 species including 9 raptors.